California this week called for tighter regulation on E-cigarettes and said it would implement an educational campaign to reduce their use. Health officials in the state said the devices–which vaporize nicotine solution–re-normalize smoking tobacco. So what’s actually in the solution and why are have devices drawn ire from the California government? “There’s a variety of potentially and actually toxic chemicals in the vapor depending on the brand and/or flavor. 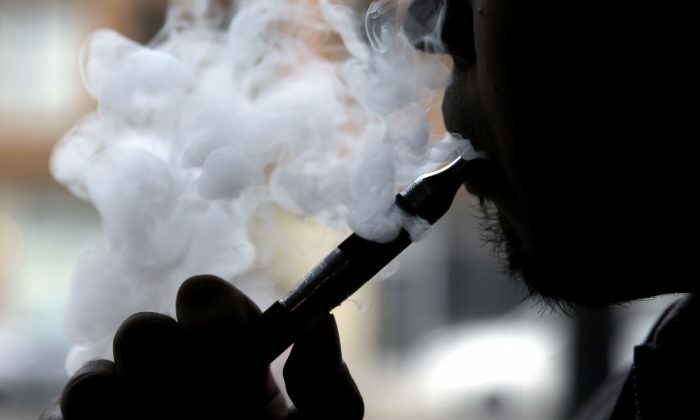 People nearby would also breathe in the vapor,” Dr. Ivan Walks, former chief medical officer of the District of Columbia, former member of the Association of State and Territorial Health Officials, told Epoch Times. Walks isn’t involved in California’s recent moves against E-cigarettes. He noted some E-cigarette manufacturers have targeted children with “candy”-style flavors. “E-cigarettes work similarly to a vaporizer which is commonly used to allow inhalation of a therapeutic substance. However, using the e-cigarette creates a vapor that also contains the chemicals used to flavor and produce the product. Many of these products have been determined to be toxic. The ingestion of these same chemicals have caused many children to be taken to the ER,” he added. Now, it’s not exactly clear if E-cigarettes are as harmful as smoking normal cigarettes. Nationwide anti-smoking campaigns have done an effective job in getting people to avoid smoking tobacco by portraying it as unhealthy and a disgusting habit. Some experts have argued that E-cigarettes have effectively done away with that stigma. However, there’s still potentially harmful chemicals found in E-cigarettes. His comments drew criticism from E-cigarette manufacturers. “This report inappropriately paints this complex and important public health topic as a black and white issue,” said Gregory Conley, president of the American Vaping Association, according to the Reuters news agency. “Despite the health officer’s false claims, there is ample evidence that vaping helps smokers quit and is far less hazardous than smoking,” Conley added. Chapman said 7.6 percent of California’s young adults between the ages of 18 and 29 used E-cigarettes, up from 2.3 percent in 2012.